This Interview with Saw H--- describes events occurring in Hpa-an Township, Hpa-an District, during the period in April 2015, including land confiscation and explicit threats. 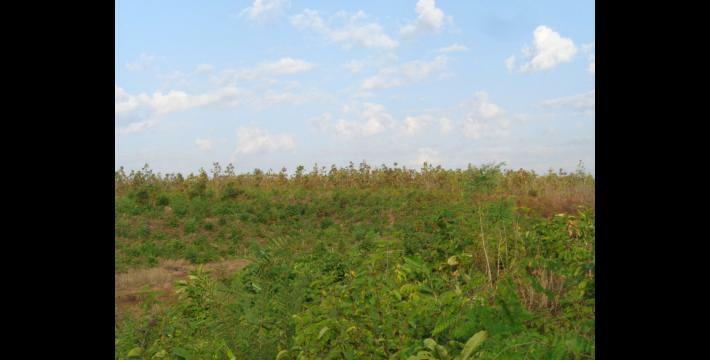 A business named Kyaw Hlwan Moe and Brothers Company confiscated 500 acres of uncultivated land which included villagers’ rubber plantations, teak plantations and pastureland. Villagers have land grants for their farms but they do not have land grants for the pasturelands. 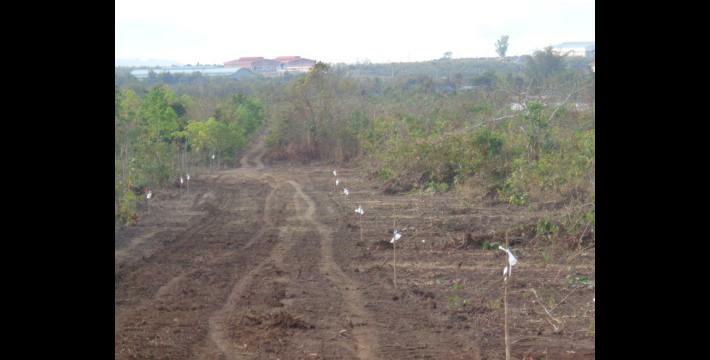 The company cleared the plants in the plantation and made the plots with the purpose of selling these plots to other people. Saw H--- describes that another company named Mya Htay Kywe Lin Company also confiscated 1,150 acres of land which included many villagers’ farm lands and plantations. 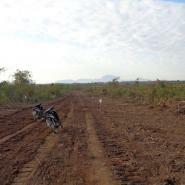 The interviewee also reports that some of villagers’ lands are included in an industrial zone that was planned by the Burma/Myanmar government. Villagers have been threatened by the Kyaw Hlwan Moe and Brothers Company and Border Guard Force (BGF) soldiers to not work on their land anymore and were forced to move from their lands. Villagers used their own strategies by meeting with the company in charge and the local authority as well as submitting complaint letters to township, district, state levels and central government but they have not gotten back their land yet. The following interview was conducted by a community member trained by KHRG to monitor local human rights conditions. It was conducted in Hpa-an District on February 2nd 2016 and is presented below translated exactly as it was received, save for minor edits for clarity and security. This interview was received along with other information from Hpa-an District, including one other interview and 40 photographs. I’m married. I have three children. What do you do for your living? I work on a farm, plantation, and run a restaurant. I do not have good income during this time. So do you have [your own] farm and plantation lands? Yes, I do have [own] quite a lot of farm and plantation lands. Some are confiscated. How many acres of farm lands do you have [own]? Currently I have over 20 acres of land in Koh Koh area. There are around four acres along the Y--- road in Man Kan village tract. These lands have not been confiscated yet. 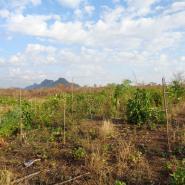 My lands in east Pa Tok and south Pa Tok area [in Hpa-an Township] are all confiscated. Who confiscated the lands in Pa Tok area? Kyaw Hlwan Moe Company [Kyaw Hlwan Moe and Brothers Company] came and confiscated the lands in east Pa Tok area. Many local villagers’ lands were confiscated. I am a representative of them. In which village do you live currently? I currently live in Hpa-an Town. My home town is B---. My wife is from C---. Pa Tok is wide uncultivated land, about 4,000 to 5,000 acres between Mi San village, Man Kan village, and Kok Ku village, in Hpa-an Township. Myanmar Government called the fields east Pa Tok, west Pa Tok, north Pa Tok, south Pa Tok. In which township does Pa Tok exist? How far is it between Hpa-an and Pa Tok? The distance is about three to four miles, from Taung Ka Lay village in Hpa-an Town. How many villages are there in Pa Tok field? There is no village there. There is only pastureland and pa lat land. In Burmese [Burma/Myanmar government definition] it is called uncultivated land. So who owns those lands now? Kyaw Hlwan Moe Company confiscated 500 acres of land in total. The current pastureland of south Pa Tok number is #1099 and it is located on the Mi San village side. All of our lands have numbers. [Interviewee shows a map to KHRG community member] All of the current land numbers are the villagers’ lands. Those are the uncultivated lands. So do all of these land numbers have land grants? Of course they all have [land grants]. So when did the Kyaw Hlwan Moe Company confiscate these lands? 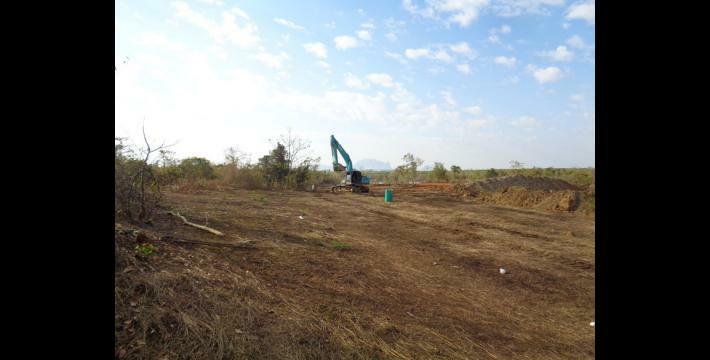 We have seen that the company came and started clearing the land with the bulldozers from April 2015. They came with the BGF [Border Guard Force] group, including the leaders; General Htun Hlaing [from BGF], General Chit Thu [from BGF], and Thein Zaw Min [from BGF] was the security in charge. They [BGF’s soldiers] fired guns about 40 to 60 times per day. But they did not intend to kill people. Their purpose was to threaten people. Why did they shoot the guns? They [BGF soldiers] said that those lands are theirs. They set up the barriers and gate there. Those are the areas Kyaw Hlwan Moe confiscated. On the other hand, in the lands which are south Pa Tok Extended Industrial Zone Land number #1099 (A) and (B), and east, west, south, south Pa Tok lands, they are in the Extended Industrial Zone project planned by the [Burma/Myanmar] government. How many acres of farm are there in Pa Tok area? Only the Land Record Department [of Burma/Myanmar Government] will know the exact number. Even me, I came upon these documents [Interviewee showed the document to the community member]. These documents are ordered for advertisement. As my friend said, they hide the documents in the box. I got them secretly from the office. [Censored for security] If I did not do that, I would not have any document. I submitted the objection letter to U Nyunt Win, who is the township land surveyor [of Burma/Myanmar Government], at his office. But there is no result. People [company workers] who cleared the land on [January] 24th  said that the 1,150 acres of lands are theirs; The Mya Htay Kywe Lin Company claimed that the 1,150 acres of lands are theirs. The farmers did not know anything about this. They [company] did that with the purpose of not letting anyone know. The village head might know and might get the money [from the company]. We local people do not want the money. We are mainly trying to get back our land, because the land cannot be lost but money can be lost. But now the land is also lost. Did villagers send a complaint letter to the government about the land confiscation by the Kyaw Hlwan Moe Company? We have everything [the record of the complaint letter]. So what did the government say? The government did not reply. I sent many complaint letters to U Zaw Min [Kayin State Minister] when he was in office. I also sent complaint letters to [Second Vice] President U Nyan Htun [chairman of Federal Land Use Management Committee]. They did not reply anything. We sent [a complaint letter] to Nay Pyi Taw. I also sent [a complaint letter] to the KNU [Karen National Union]. I sent [a complaint letter] to Township Chairman Poe Thar Din through Pa Doh Mahn Shwe Kyun [from the KNU]. I am a representative of [censored for security] and do as they desire. I will be doing it until we are successful. Do the farmers work on those farms now? They dare not work on the farms now as people [BGF soldiers] shoot guns every day. They dared to work before. Until when did they work on that farm? When did they stop farming? Some stopped farming a long time ago. According to what I heard, I am not sure whether it is true or not, the lands have been confiscated since 1994. Since the DKBA [Democratic Karen Buddhist Army] era, these 500 acres have been confiscated. I do not know when it started again, when the BGF was formed, this same group who was in DKBA confiscated those lands. Those people are formal DKBA members who are making conflict [confiscating land] in this area currently. People involved in the confiscation of Man Kan 500 acres which is east Pa Tok land are all [BGF] generals and majors. So, how do the farmers who cannot farm earn their living? They have to buy and eat rice. Before, my father used to have 70 to 80 cows and these lands are the pastureland for the villagers’ livestock. Now, there is not even the soil to plant the paddy. They have cleared everything. Currently, villagers only have land grants for the farms so they would only give back the farms. For the pasturelands, local villagers do not have land grants on the pasturelands, only the companies get land grants. What is the company’s purpose for that area? According to what we saw, on the current land that they are building the foundation, their purpose is to dig [mine] the antimony. That is what we heard but we do not know about the detailed information. 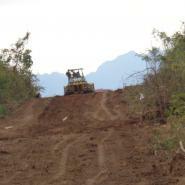 As we know, they clear the land and construct the road for their plan to pile a new section area. They have a plan that they will pile the houses and lands, as we have seen and known. But we do not know the information exactly. What we asked the bulldozer drivers, the information is as I mentioned above. Before, in this area [Pa Tok], farmers nearby worked on it. All villagers around that area collected the wild vegetables and fruits, and worked on that land. Now, nobody dares to go in that area. So, are there any villages in those 500 acres [of Pa Tok]? It is just wild land and villages are situated around it. Which villages are around it? A---, D---, E---,G---, and M--- villages. There are five villages. Sorry, I forget. Which company confiscated the land? [It is] Kyaw Hlwan Moe and his sibling’s company. They confiscated 500 acres of land. What is the name of the owner of Kyaw Hlwan Moe Company who confiscated these lands? U Kyaw Hlwan Moe from Toungoo Town. That company confiscated the 500 acres of land. On the other hand, the land clearing for the industrial zone which is 1150 acres wide on February 24th happened later. That was confiscated by the [Burma/Myanmar] government. Mya Htay Kywe Lin Company was also involved. The people from that company are former DKBA members. Who is the owner of the Mya Htay Kywe Lin Company? There are a lot of owners of the company. If we mention the names it will be about one page. All are generals and majors. There are around seven or eight people [generals and majors]. Those people are former DKBA members. The problem with these lands started in 1994, and none of the villagers knew about it. For example, you [community member] are the land surveyor, he [someone] is the village head, he [someone] is the land owner and I am the land owner. The company, village head and the land surveyor will check on the map which lands are the villagers’ lands. The rich business people will ask which are the uncultivated lands and the land surveyor will circle the uncultivated lands on the map and give it to the rich business people. The farmers do not know anything. The administrator might know about it. When they do, they invite only the administrator. They do not invite the farmers. All of the people who work on that land worked for ta won kyay san ba. In the past, during the Sa Thone Lone (Sa Sa Sa) era, they [farmers] had to send 25% to 30% out of 100% of the rice to Hpa-an Town [tax for authorities]. The authorities do not have the sympathy for the villagers for what they have done like this. The authorities give 300 acres to 500 acres to the rich business people and companies. So because they confiscated the lands like this, what difficulties do the villagers face? Now, they face difficulty. For example, when the population in the family increases and when the villagers have children and the family is bigger, some people who have some money, around 400,000/500,000/1,000,000 kyat [US $337.62/ US $422.02/US $$844.04] or 1,500,000 kyat [US $1266.06], want to get a new plantation land such as rubber plantation, teak plantation. 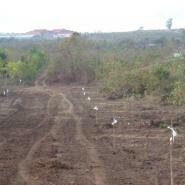 But to clear the wild land to make a plantation area, the authorities do not give permission. But the company can work on the land. What does it mean? I cannot understand [why the authorities do this]. What armed groups are there in that area now? It is BGF cantonment area #4.
Who is the colonel of the cantonment area #4? When they came, what did they do to the villagers? They were threatening villagers and shooting guns. They have a plan to force the villagers off the land. This is my rubber plantation land [interviewee pointed on the map]. These are the wild lands before. These are the places flooded by the dam. This is the dam. So there is the dam in that area? [There are] a lot [of dams]. It affects the farms in the area a lot. What is the name of the dam? There is no name [of the dam]. It is not Yay Bote. Here, take this evidence [map]. There is a warning signboard, not to pass over the area. When did they start placing that signboard? [It was] in April 2015. I do not know the day. When P--- and I worked in the farm, it was the rainy season. Here are their patrol tanks [gesturing to photograph]. Here is their office. Here is their manager. What is the name of the manager? Now, all managers have changed. Currently, the security in charge is Thein Zaw Min. Who is Thein Zaw Min? Thein Zaw Min is from BGF. I do not know whether he is colonel or general. Probably he is colonel because I heard people call him Colonel Thein Zaw Min. His senior is General Htun Hlaing. General Htun Hlaing and Maung Chit Thu have the same rank [BGF top rank]. We want the government to help us. We want our lands back. Because, they should not let the farmers suffer anymore. The farmers have suffered that much. They do not care about anything. They only care for the rich business people and the poor always have to keep our chins down. We cannot keep our chins up at all. Which part of Pa Tok is this [pointing at map]? This is eastern Pa Tok [area]. The land number of eastern Pa Tok is, #1100 (A), (B), (C) it is all written on the map. Do some of the farmers work in the farms there? There are some [farmers who work in the farms]. But most people dare not work anymore, because they threatened people who work in the farms. It has been three or four years [happening like this]. It is not just happening for the previous months, it has been years. If the farmers plough in their own farm, they [the companies] will take action with an article [criminal charge]. They can say which articles, I do not know which articles. Who said that they will take action? A person from Industrial Zone Committee. I do not know his name. His name is in my list. We have suffered a lot. So, as a representative of the local people, what do you want? We want them to discuss with the local people and allow them to work on the farms. We do not know whether the land will be in the Industrial Zone or not. The farmers want to know how their lands arrive in other people’s hands. The farmers do [work on] plantations for subsistence. But now they are not allowed to work. They order the villagers to move and destroy the plantations. We doubt that we are real Myanmar citizens. So, understand us. We were forced to leave our land even though we work for subsistence. So what do we do? So, as you said, villagers did not get a land grant for those farms? We have a land grant for the farms. For the pasture lands, when they [government] provided the grant, the authorities did not prioritise us but they prioritised and gave opportunity to the company. We do not know exactly, why [they do that]. Everyone wants the pasture land for subsistence farming. Who gave out the land grant for the farms? [Burma/Myanmar Government officials in] Hpa-an office [in Hpa-an Town]. Is there anything else I have not asked you that you would like to say? I want them not to bother us anymore. We work in the farm as we do not have money. And they bring us to the office again and again. There is no mediation but only threatening of the villagers. It has been four to five times that I arrived at the [Myanmar government] district office. I went by myself. The last time, nobody went [with me]. They knew that the authorities would arrest them so they dared not go. So I went there alone. There are many people who are illiterate. I want them [government authority] to understand us. These people are the local people, who worked for the country in the past even if they are illiterate. But they [the company and government] want us to move out from our land. If I look at my uncle, he is illiterate but has been farming since he was young. Look now, the farms that he has worked for many years, for over 40 years have been confiscated now. What do we do now? We do not get back our land and just have to stare [look at what company does] like this? Moreover, these people from an armed group came, fired guns and threatened us. And we [BGF and villagers] are the same Karen ethnicity. So, how is the current situation now? The current situation is getting worse. 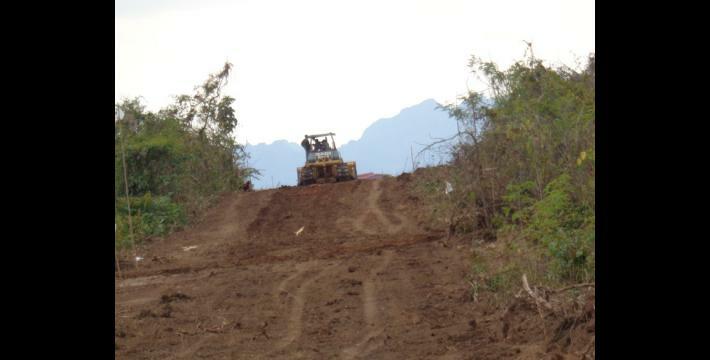 Before, we saw that only one or two bulldozers were clearing the land in eastern Pa Tok. 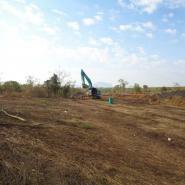 Now, they [company] sent more bulldozers [to clear the land] for the industrial zone project in Mi San area. They do [work] as they have the resources [money and human resources]. We have to say that the situation is getting worse. And the plants that we grow, such as rubber and teak plantations, are all destroyed. We did not destroy our plantations by ourselves and they made trouble to us. Who is U Naing Aung? State land surveyor chairman [of Kayin State]. How did he make trouble? If we did not destroy the plants by ourselves, he would take action on [charge] us. And he told us that he would imprison us but we do not know for how many years. We did not listen to him after that. Where did he tell you? At the district administration office [in Hpa-an Town]. They invited us to go and we went there. I have the invitation letters. I have the records of how many times and which date. How many times have you met him? Around five times, from 2013 to 2015. When he invited you, what did he say? He threatened us. He forced us to leave our lands. He said that “people who do [work on] plantations are not [allowed] to do [work on] plantations anymore. If you do we can take action on you. We can arrest you.” Now, it becomes our fault. What the local people do is wrong. We do not know in which year U Naing Aung arrived to Hpa-an Town. We do not know where he was born. It is like he forced us to get off from our land. If we say [deal with the case] in a judicial way we cannot win. We do not know anything about law. Some of us cannot even sign our name well. Why did land surveyor chairman U Naing Aung force villagers to leave the land? The place is in the area of the Industrial Zone and Extended Industrial Zone. He is involved in the Kyaw Hlwan Moe [land confiscation] issue too. They are the people [perpetrators] who did it. They said to pile the ground. 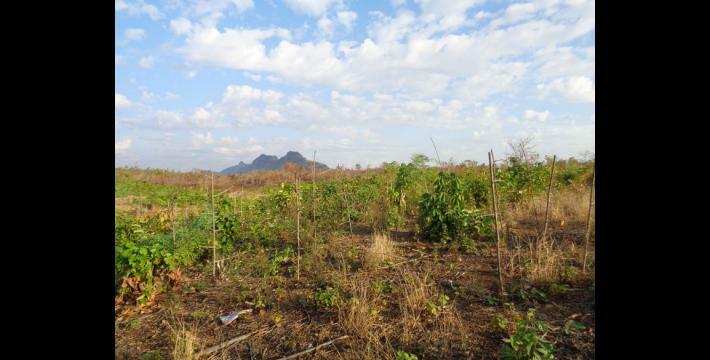 Kyaw Hlwan Moe Company submitted to the government that they would do short-term and long-term plantation but now they are going to pile the land. We cannot think about that. We and Kyaw Hlwan Moe did a press conference once in Y--- monastery. He said that he is not confiscating those 500 acres of land. He said he had to pay money for the lands. Kyaw Hlwan Moe said it by himself. And after 15 days or a month, U Nyunt Win invited and met with us in District Administration Office. Who is U Nyunt Win? He is the township land surveyor. When we went, U Nyunt Win said that those lands are Kyaw Hlwan Moe’s property which he asked for the ownership of from the government, and he piled these 500 acres. And I considered that when Kyaw Hlwan Moe came to the office he said that he bought these lands. But when we went to the office, we were told that the lands are owned by Kyaw Hlwan Moe by getting the ownership permission from the government. So what Kyaw Hlwan Moe and the land surveyor said were different. We could not solve the problem and we asked for help from the KNU who are educated. According to the situation, we have not known the result [from both authorities] yet. We have seen that in the southern area [of our village], the situation is getting worse. 500 acres of land are almost totally cleared. Now some land owners are sitting crying. It has been many times that we [have] objected. Kyaw Hlwan Moe said that he bought the land and did he say who he bought the land from? He did not say that. He did not say the name. He just said that they bought the land but they did not say where they bought it and how much. So, who is Daw Thet Thet Oo [name on the document]? They are siblings. Totally, there are 11 people in Kyaw Hlwan Moe Company. By the way, actually he [Kyaw Hlwan Moe] is the only one who owns the company but he just put the other people’s name in the ownership of the company. Those people have knowledge. They already have a plan to lie to these Karen people. They know which way they can lie to us. 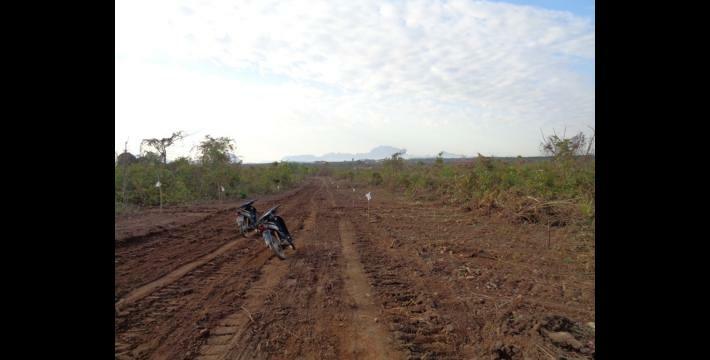 Currently, I have 26 acres of rubber plantation and 15 acres of vacant land. There are 41 acres in total. Now, they order me to clear them all but I do not clear them and stay like this. Is there anything else that I have not asked that you would like to say? I wish that the things that the local people are trying unitedly will be successful. KHRG trains community members in southeast Burma/Myanmar to document individual human rights abuses using a standardised reporting format; conduct interviews with other villagers; and write general updates on the situation in areas with which they are familiar. When conducting interviews, community members are trained to use loose question guidelines, but also to encourage interviewees to speak freely about recent events, raise issues that they consider to be important and share their opinions or perspectives on abuse and other local dynamics. Saw is a S’gaw Karen male honorific title used before a person’s name. Hpa-an Township as the villager refers to it here is as defined by the Burma/Myanmar government, rather than the KNU definition of Karen township. 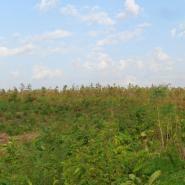 Pa Lat is a Burmese term referring to land that is not being used for plantation, despite being plantation land. There are two kinds of Pa Lat land. (1) Pa Lat land which is no longer being used to restore the soil, or on which plantation cannot currently be done; and (2) Pa Lat land which cannot currently be used but would be usable after maintenance. Border Guard Force (BGF) battalions of the Tatmadaw were established in 2010, and they are composed mostly of soldiers from former non-state armed groups, such as older constellations of the DKBA, which have formalised ceasefire agreements with the Burma/Myanmar government and agreed to transform into battalions within the Tatmadaw. BGF battalions are assigned four digit battalion numbers, whereas regular Tatmadaw infantry battalions are assigned two digit battalion numbers and light infantry battalions are identified by two or three-digit battalion numbers. For more information, see “DKBA officially becomes Border Guard Force” Democratic Voice of Burma, August 2010, and “Exploitation and recruitment under the DKBA in Pa’an District,” KHRG, June 2009. Maung Chit Thu, commonly referred to as Chit Thu, was the operations commander of Democratic Karen Buddhist Army (DKBA) Battalion #999 prior to the DKBA transformation into the Tatmadaw Border Guard Force, which began in September 2010. His role has grown considerably since the transformation: he was second in command of Tatmadaw Border Guard Forces, overseeing BGF battalions #1017, #1018, #1019 and #1012, and is now a senior advisor and general secretary of the Karen State BGF central commandbased in Ko Ko, Hpa-an District. Abuses committed by Maung Chit Thu have been cited in previous KHRG reports, including ordering the forcible relocation of villagers from eight villages in Lu Pleh Township in July 2011, while acting as a Border Guard commander, see, “Pa’an Situation Update: June to August 2011,” KHRG, October 2011. For more information on the DKBA/Border Guard transformation, see, for example: “Border Guard Forces of Southeast Command formed in Paingkyon of Kayin State,” New Light of Myanmar, August 22nd 2010; and “Border Guard Force formed at Atwinkwinkalay region, Myawaddy Township, Kayin State,” New Light of Myanmar, August 25th 2010. U is a Burmese title used for elder men, used before their name. Naypyidaw (also spelled Nay Pyi Taw) is the capital city of Burma/Myanmar. In 2005 the military regime moved the capital from Rangoon to a greenfield at its present location, 320 kilometers (200 miles) north of the city. See “Nay Pyi Taw now less of a ghost town,” Bangkok Post, December 11th 2013. S’gaw Karen term for a person in a position of authority in civil administration. The Democratic Karen Buddhist Army (DKBA) was originally formed in 1994 as a breakaway group from the KNLA. Since its separation from the KNLA in 1994, it was known to frequently cooperate with and support the Tatmadaw in its conflict with the KLNA. The original group underwent major change in 2010 as the majority of the original DKBA was transformed into the BGF, which is under the control of the Burma/Myanmar government, while the rest of the original DKBA formed a smaller splinter group, which is often referred to as DKBA-5 and changed its name in 2012 from the Democratic Karen Buddhist Army to the Democratic Karen Benevolent Army. Following this major change in 2010, the original DKBA is considered to no longer exist as a distinct entity as it has now been submerged within the BGF. This original DKBA (Buddhist) (1994 – 2010) should not be confused with either the DKBA (Benevolent) (2010 – present) which was formed as a breakaway group from the original DKBA (Buddhist) (1994 – 2010), or with the DKBA (Buddhist) (2016 – present) which was formed as a splinter group from the DBKA (Benevolent) (2010 – present) in 2016. For more information on the formation of the DKBA, see “Inside the DKBA,” KHRG, 1996.
 ta won kyay meaning responsible and sa ba meaning paddy. It refers to villagers growing rice for the government. Sa Sa Sa (Sa Thone Lone) was the intelligence service during the SPDC era. It was replaced by Sa Ya Pa (Military Security Affairs) in 2004, after Khin Nyunt fell from favour.